Short sales happen when home values fall, and sellers do not receive enough cash from a buyer to pay off their existing mortgages, providing lenders agree to take less than the amount owed to them. On the surface, it may appear that a short-sale buyer is getting a good deal. Although a slim margin of short sales may be profitable for a buyer — because there are always exceptions — much of the time, a buyer would be better off buying a home that is not in default. Short sales are not sold at discounts. You are unlikely to hear real estate professionals tell you that it's not a good idea to buy a short sale. In part, that's because real estate professionals profit on a short sale. Everybody makes money except the sellers and buyers. Realize, too, that listing agents might push sellers to list as a short sale because if the sellers went through foreclosure, the listing agents would not get the listing. There are many agents who ignore short sales and suggest their buyers buy something else. These are often agents who were burned in the past and had short sales fall apart because they were listed by an agent who had no business listing a short sale. Sellers Paid Too Much: If a home sold for $500,000 a few years ago and is now for sale at $400,000, that doesn't mean the buyer is picking up $100,000 of equity for free. It means the seller paid too much in a rising market and now the market has fallen. This means the seller has no equity. Sellers Borrowed Too Much: Banks that were eager to lend money in appreciating markets sometimes allowed borrowers to over-mortgage the home, meaning the borrower's loan balance exceeded the value of the property. Appraisals are subjective, and not all appraisers will place the same value on a home. Although against the law, some appraisers are pressured by banks to appraise at the amount the homeowner wants to borrow. 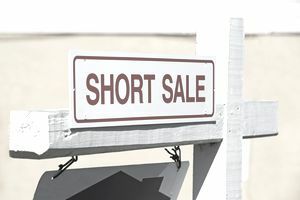 Stringent Qualifications: Inexperienced or unethical real estate agents might push a seller into considering a short sale when the seller does not qualify for a short sale. Sellers must prove a hardship and submit evidence of the hardship to the lender for approval. Some agents list homes as short sales without ever talking to the lenders or pre-qualifying the sellers. Homes Sell at Market Value: Lenders aren't naive or unaware of the value of a home. Lenders will insist on a comparative market analysis, known as a CMA, or broker price opinion, known as a BPO. If a lender believes a better price can be obtained by taking the property in foreclosure over a short-sale offer, the lender may hold out for a higher price. That price will be close to market value. Lenders accept short sales when the home is worth the short-sale price, which means market value. Homes Sell "As Is": If a mortgage company agrees to a short sale, it is most likely also paying the closing costs in the transaction. Lenders ask buyers to purchase the home in its present condition. Lenders typically will refuse to pay for suggested repairs disclosed on a home inspection. Pest inspections or work necessary to issue a clear pest report. Roof certifications or roof repairs. Home protection plans for the buyer. Deferred maintenance. Length of Time to Close: Depending on when the Notice of Default was filed, the lender's backlog of foreclosures and how much paperwork the seller has already submitted, it could take anywhere from two weeks to two months to get a response on a purchase offer from a lender. Also, if two lenders are involved because there are two loans secured to the property, it could take longer to satisfy the demands of the second lender. Lenders Can Change Conditions: Some lenders reserve the right to renegotiate the terms of the short sale at the last minute. If the market changes, new laws pass or new information crosses the lender's desk, the lender can attempt to change the terms of the contract. Lenders generally have lawyers at their disposal, and ordinary buyers do not. Lenders Discount Commission: Lenders who have sold loans to Fannie Mae or Freddie Mac generally pay traditional real estate commissions to real estate agents. Others may demand a discount. Moreover, agents end up doing two to three times the work of a conventional transaction and don't appreciate getting paid less to do more work. If you have agreed to pay your agent a certain percentage under a buyer broker agreement, you could be liable for the difference between what the lender will pay and what your contract stipulates, if your agent refuses to waive the difference. Higher Buyer Closing Costs: Because lenders rarely will pay for any extras, like a seller would be willing to do, if you want any of those extras, you will pay for them yourself. Sometimes lenders will refuse to pay for standard seller closing costs such as transfer taxes, too. If you want specific inspections, you will probably pay for them out-of-pocket. Lose Control of Transaction: If you need to close escrow by a specific date, lots of luck with that. A short sale home closing process takes an indefinite amount of time. The seller's lender calls the shots, not the buyer nor the buyer's lender. If you are trying to close escrow concurrently with the sale of your home, it might not happen. Little Seller Motivation: When the seller discovers that the short sale effect on credit is close to that of a foreclosure, there is little incentive for a seller to cooperate with a short sale. Although sellers may qualify to buy another home in 2 years after a short sale versus 5 (with restrictions) on a foreclosure, some have no intention of ever buying another home again.